Market Lavington has what it takes for brick making – areas of suitable clay – and bricks have been made in the area for centuries. Brick making in Market Lavington is long since a thing of the past. The old clay quarry has been filled, levelled and has other industrial uses. Some of the old brickworks building, down on Broadway near the bridge under the railway, are still in existence and used by a local company. The old brick master’s house has been renovated, with some features never on the original building and remains a rather lovely looking residence. 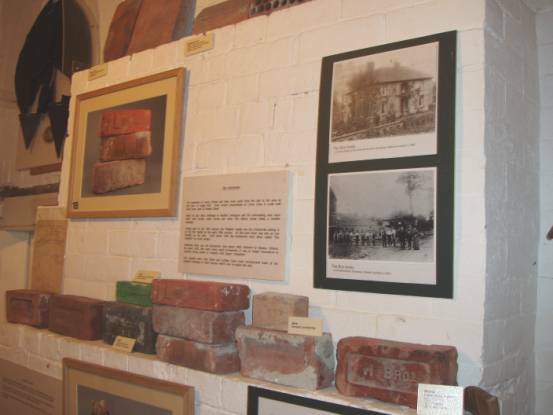 But for real memories of the brick industry you’ll need to visit the museum at Market Lavington where we have done a little tidy up and revamp of the brick area. Here, you’ll see all sorts of bricks made in Market Lavington over the past couple of hundred years. Many are standard enough looking bricks with different manufacturer’s names embossed in the ‘frog’. One locally made brick even commemorates the coronation of King George V in 1910 with information in that depression which bricks have (the frog) which is never seen once the bricks are used. As well as bricks there are tiles including examples of mathematical tiles, which are designed to look like bricks when hung. There are also floor tiles and specialist ventilator tiles from maltings. Of course, there are photos, including some of the Box family who were the owners of the company at the end of the nineteenth century and other artefacts associated with the business. So, if you wish to know more about what was once a major business in our parish, then do visit the museum. This entry was posted on May 6, 2011 at 5:52 am and is filed under Museum. You can follow any responses to this entry through the RSS 2.0 feed. You can leave a response, or trackback from your own site.